Splendidly located on Sydney Harbour, Vaucluse House is nestled in a 19th century estate with a kitchen wing, stables and outbuildings. It is surrounded by 27 acres of gardens and grounds. The home of William Charles Wentworth, father of the Australian Constitution, his wife Sarah and family from 1827-1853, Vaucluse House depicts the social aspirations and lifestyles of the Wentworths and of the servants who lived and worked there. Vaucluse House is a rare survival of a 19th century harbourside estate. It retains most of its domestic offices and kitchen, stables and outbuildings and is still surrounded by 28 acres (ten hectares) of gardens and grounds. Begun as a small cottage in 1803, Vaucluse House greatest significance comes from its later ownership by the Australian patriot William Charles Wentworth, his wife Sarah and their immediate family of 10 children. The Wentworths lived at Vaucluse House from 1827–53 and again in 1861–62. They rebuilt and greatly enlarged the house. William Charles Wentworth's achievements include exploration, lifelong agitation for representative government, the formation of the nation's first university and numerous other political achievements. He was instrumental in drafting the constitution which gave New South Wales self government in 1855. Vaucluse House paints a picture of the social aspirations and lifestyles of the Wentworths and of the servants both convict and free, who lived and worked there. The Gothic style mansion, with its picturesque turrets and castellations, includes fashionable entertaining rooms and functional 'downstairs' areas. The interior includes original Wentworth pieces together with furniture, furnishings, and collections of the early to mid 19th century. The extensive gardens and grounds have been restored to their 19th century character. The 27 acre estate includes pleasure garden, parkland, bushland and beach frontage. Today, Vaucluse House is one of the few 19th century houses on the harbour retaining a significant part of its original setting. 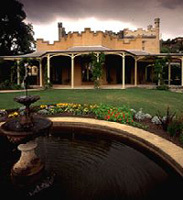 The Vaucluse House Tearooms, open daily except for Monday, are famous for their tantalising cuisine. The Shop is designed with an emphasis on childhood (due to the number of children borne to the Wentworths), material on Vaucluse House itself and the Garden. Members Free, General $7.00, Concession/Child $3.00, Family $17.00. Wheelchair accessto ground floor only, braille, large print, audio guides, shop, guided tours, education programs for children juniors and seniors, tearooms on site, exhibitions, venue hire. The interiors include original Wentworth pieces together with furniture, furnishings and collections of the early to mid 19th century. Vaucluse House collection, presented by Miss Dorothy Wentworth. The Vaucluse House entrance hall and drawing room abounds in 19th century copies of Italian Renaissance paintings. The subjects include a Madonna and Child after Raphael, a Penitent Magdalene, Sebastiano del Piombo’s Portrait of a Man and Guido Reni’s Aurora. The collection reflects the revival of interest in Italian Renaissance fine and decorative arts from the 1840s onwards led by tastemakers such as Prince Albert, consort of Queen Victoria. 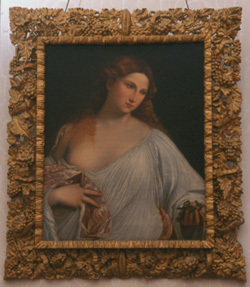 Studios, such as Fillippo Cumba of Florence (responsible for the copy of Guido Reni’s Aurora, dated 1858) made popular images available to a wider public not seeking the authenticity of the originals. Owned by William Charles Wentworth (1790–1872) and Sarah Wentworth (1805–1880) of Vaucluse House and later their son, FitzWilliam Wentworth Vaucluse House collection, presented by Mr George Neville Wentworth. Pietra dure, decorative mosaic of semi-precious hardstones, such as agate, jasper, chalcedony and lapis lzuli was brought to technical and artistic excellence in Florence in the 16th century. It was used for decorative table tops, caskets and cabinets in geometric designs and to portray arrangements of flowers and fruit, landscapes, portraits and religious subjects. It was a popular acquisition for northern Europeans embarking on the Grand Tour in the 18th century and colonial Australians embarking on a discovery of Europe in the 19th century. The Wentworth family toured Italy (as far south as Naples) in 1858–1859. 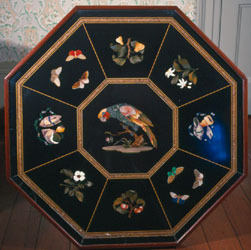 The Vaucluse House also possesses two scagliola table tops collected at this time. Owned by Sarah Wentworth (1805–1880), wife of William Charles Wentworth (1790–1872) of Vaucluse House Vaucluse House collection, presented by Mrs A Wentworth Weekes. This chatelaine has a large ornamental clip for fastening to the waistband of a dress. Characteristic of Dutch silver, it is decorated with panels of scriptural scenes. 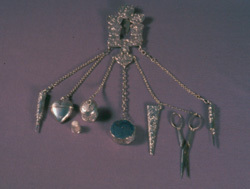 Items of daily use in household management – scissors, pencil, thimble, vinaigrette and needle case - were suspended from the clip on small silver chains. The chatelaine has mediaeval origins. Its reappearance in the 19th century may been a consequence of the Gothic Revival. Image of three daughters of William Charles Wentworth, painted in England.